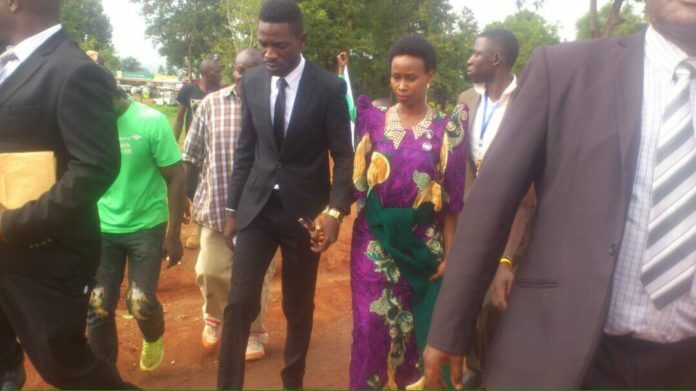 VICTORIOUS: Robert Kyagulanyi aka Bobi Wine and his wife Barbie Kyagulanyi. Famous artiste Robert Kyagulanyi Sentamu popularly known as Bobi Wine has this morning been nominated as an independent candidate in the Kyadondo East by election. Accompanied by his wife Barbra Kyagulanyi aka Barbie and a number of supporters, Bobi Wine arrived at the Electoral Commission Offices in Kasangati. 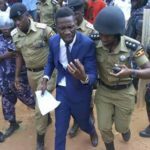 Bobi Wine joined the race after the nullification of Forum for Democratic Change (FDC) candidate Apollo Kantinti’s election by High court Judge Isabirye Kaweesa on grounds that the Electoral Commission did not comply with the electoral laws. 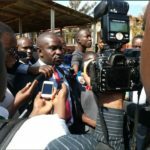 Subsequently, the National Resistance Movement (NRM) candidate William Sitenda Sebalu filed an electoral petition, in which he accused the EC of violating electoral laws, and also charging that the election was characterized by voter bribery among others. 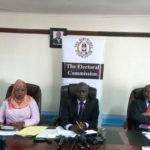 “We expect no violence and whoever may try to incite it will be dealt with accordingly,” the EC Deputy chairperson Hajjat Aisha Lubega, said after nomination of Bobi Wine. Meanwhile, by press time today FDC candidate Apollo Kantinti had been nominated at 3pm.